MiroNet Review 2019: Is MiroNet a Good Hosting? Basel-based MiroNet has been offering local customers IT support & services in addition to cloud solutions and Magnolia CMS hosting for the last 14 years. The company’s solutions are user-friendly, safe, and pragmatic. Founded in 2005, MiroNet is a Swiss tech company that provides Magnolia CMS hosting services, cloud computing, hosted email, and IT services & support. It has strong partnerships with trusted software vendors. The company’s website is in German. MiroNet looks like a company that doesn’t take chances with both user security and website protection. SSL encryption is automatic, but what I like most is that its network is DOS protected. Once you create your Magnolia CMS website, you can also secure it with the Free Let’s Encrypt SSL certificates. When you scale up to Linux or Windows VPS, you will get a lot more value than a standard hosting customer. You won’t have to invest in local servers and upgrades are smooth and fast. The company will take care of software licensing and automatically backup your data daily offsite. If you wish, you can request server management, updates, and patches, though you will have to pay for these extras. Aside from Magnolia hosting and VPS, MiroNet also provides solid and secure business email hosting for SMEs and startups and MicroCloud. It’s good to see that customers are allowed to test drive its Cloud computing for 30 days. Overall, MiroNet’s website is easy-to-use and loads pretty fast. My only concern is that ordering seems to be Geo-restricted, meaning customers who are outside of Switzerland and most likely the EU can’t order anything. 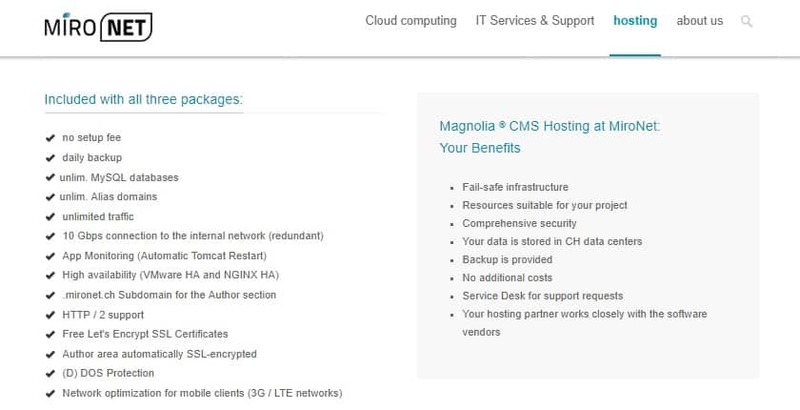 MiroNet comes across as an IT company that offers Magnolia CMS hosting as an afterthought rather than a key service, so I am hard pressed to tell you what its key selling points or value propositions are. Though it doesn’t charge setup fees, its plans and add-ons are expensive, and its add-ons and features below par. The only thing that could justify such high prices is the fact that they have partnerships with Vmware,EMC 2, vCloud, Cisco, Microsoft SPLA, and Citrix, which could translate into low licensing fees for its customers. Live operators are available via telephone from 08:30 a.m. – 6:00 p.m., though you can also send an email or submit a ticket to the service desk. I would be happy to see a knowledge base and FAQ section; it’s the least I’d expect of such as tech-savvy company. Though support isn’t in English – as I would have loved it to be – I think MiroNet does a great job of providing remote support for Mac and Windows users. MiroNet is worth considering if you’re looking for specialized hosting for your Magnolia CMS website and extras such as premium emails for your Swiss online business. 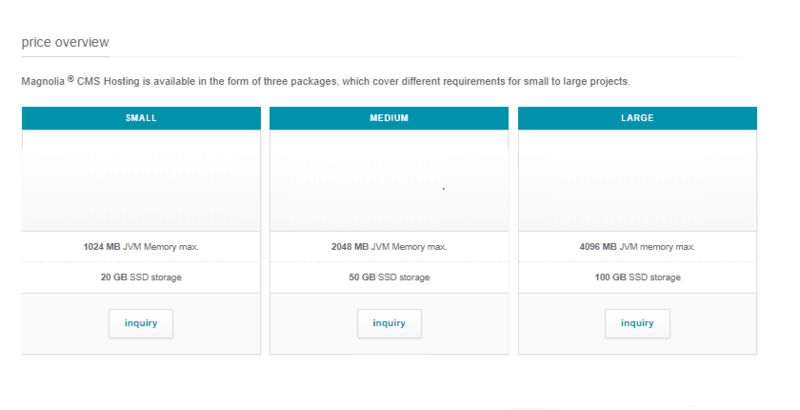 Wondering how MiroNet stacks up against other Web Hosting companies? Enter any other Web Hosting company and we will give you a side-by-side comparison.